Since we are in the Dallas area visiting family, Patrick and I decided to visit the George W. Bush Presidential Library. The library was just completed in 2013, and since we’ve been living in Austin we hadn’t had a chance to visit it yet. If you know me at all then you know that I am a huge fan of libraries of any sort, and I find presidential libraries to be particularly interesting. Of course, the part that the general public sees is more museum than library, but I find it fascinating to see how a president’s administration is packaged and presented–good and bad. Up until about 1939 any records from a president’s term in office were considered property of the president himself to be dispersed as he saw fit. Any documents from before that time are spread amongst various libraries, historical societies, and private collections if they haven’t been lost or destroyed. In 1955, after Franklin Roosevelt and Harry S. Truman started a presidential trend of donating documents to the federal government, the Presidential Libraries Act was enacted. The act encouraged presidents to donate their archives to the federal government, but they were still technically considered property of the president until the Presidential Records Act of 1978. That act established that records of the president were property of the United States Government. There are currently 13 libraries that make up the presidential library system–one for every president from Hoover forward. The George W. Bush Presidential Library, on the grounds of SMU in Dallas, is the most recent library. It was interesting to visit the library of a president whose term is still recent memory. 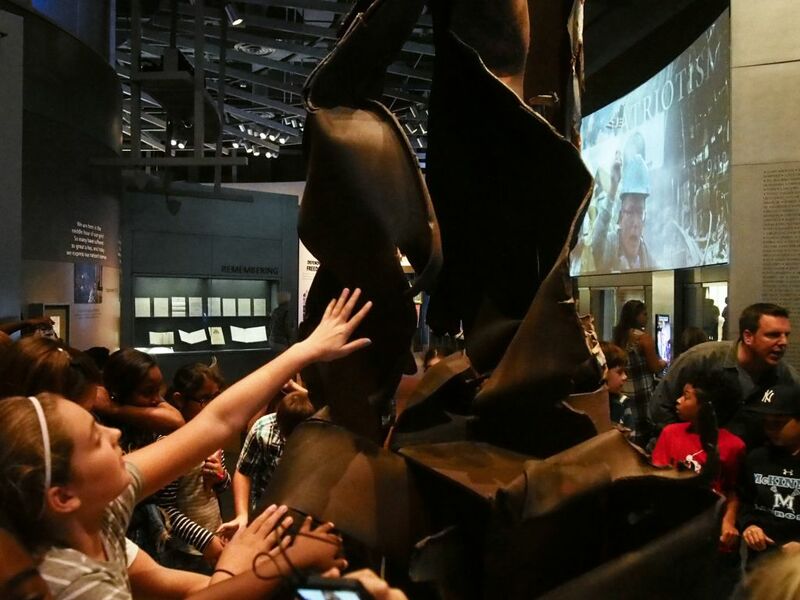 There is a very moving exhibit about 9/11 that includes a piece of steel from the towers. On the day we went there were several classes there for field trips. It was strange to watch the footage from 9/11 surrounded by children who were not alive when the attacks happened. You could tell that for them this was just a history lesson–something that happened in the distant past. This must be what it feels like to get old. Other highlights include a replica of the oval office where you can get your picture taken sitting at the desk. You can purchase the picture in the gift shop. There is also the “Decision Points Theater” where you and your friends can recreate the decision-making process for four different crises that took place during Dubya’s term. Perhaps my favorite part was the 15-acre Native Texas Park. We took a free guided tour of the park, which includes native blackland prairie grasses, a wetland prairie, and a wildflower meadow. They also have an interesting system of bioswales that collect and purify runoff water from the parking lot and lawn and direct it to the park. It was neat to see a native park surrounded by skyscrapers in the middle of downtown Dallas, and while entrance to the museum costs $16 per person, the park is free and open to the public. 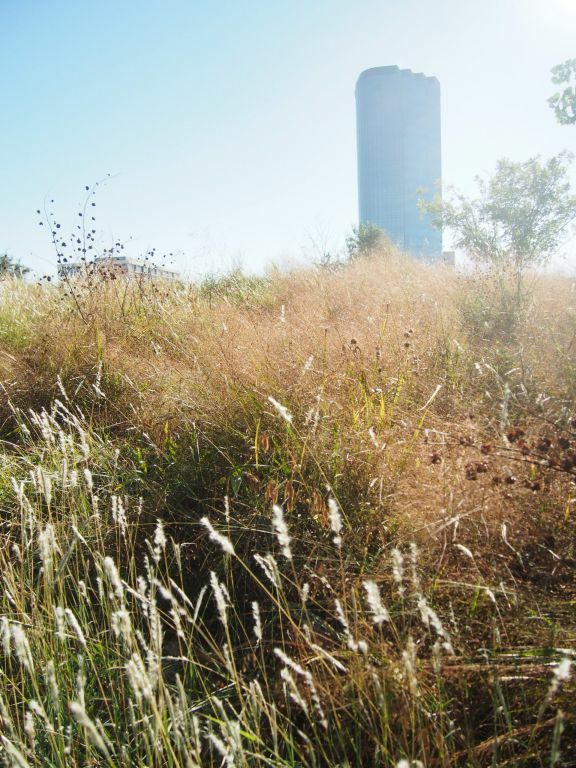 A 15-acre native park in the middle of downtown Dallas.